Take Hwy 580 East. Exit at GRAND AVENUE in Oakland. Turn Left onto Grand Avenue. We are one block off the 580 freeway. 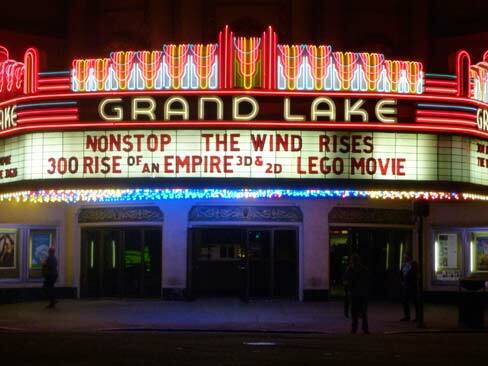 From 19th St. Station to AC Transit bus #12 to Grand Lake Theatre (Lakepark & Grand Avenue). From SF Transbay Terminal take NL bus. Get off at Macarthur Blvd & Lake Shore Av walk two blocks to the Grand Lake Theatre. Go straight onto Lakepark Avenue. We are two blocks away on the right hand side. Take Richmond BART to 19th Street Station. Transfer to AC Transit bus #12, to Lakepark & Grand Avenue. The City of Oakland lot located under the 580 freeway has free spaces after 6pm Monday - Friday and all day Saturdays and Sundays. Permit parking is in force Monday - Friday until 6pm. Paid kiosk parking is in force Monday - Saturday until 6pm. Please read signs carefully and park accordingly. Free spaces can be located in the neighborhood surrounding the theater. There is metered street parking and parking lots around the theater. Kiosk metered parking is enforced from 8:00 am - 6:00 pm Monday - Saturday (check parking kiosks for details). The current rate is $2.00 per hour. In the evening, metered spaces are free after kiosk metering ends at 6pm.